Essentially England News - Has Winter Even Started Yet? Has Winter Even Started Yet? Welcome to the first 2014 issue of Essentially England News - and a very Happy New Year to you all! We're almost through January already and while parts of North America and Northern Europe are in deep freeze, England seems closer to drowning. In our corner, we wake up to a little hoar frost on the odd morning, but generally it's wet, wetter and even wetter than that. So while I would usually look forward to marvelling at ice covered trees, this year I've already got the first primroses out. And like many people I wish someone could tell me if we're heading towards spring now, or if the start of winter has just been delayed and it's going to hit us with a vengeance. Never mind, it's a case of Carry on and Dream of Summer, so why not join me and consider holiday ideas for the historically minded. If nothing else, it keeps the winter blues away. When you're exploring Kent and Sussex, you're bound to come across references to the Cinque Ports and the Lords Warden. 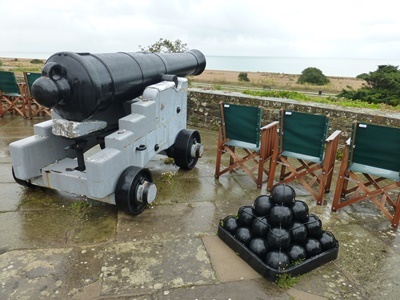 And if you love following in the footsteps of some very famous personalities in England's history, you really should head over to Walmer Castle, the base of the Lords Warden of the Cinque Ports. The castle was state of the art when Henry VIII had it built as part of the coastal defences against an invasion from the continent, but these days its more a place for ceremonies than warfare - and definitely a place to remember some of the people who held the office of Lord Warden. Walk the halls where William Pitt the Younger, The Duke of Wellington, Lord Curzon, Winston Chruchill and Her Majesty Queen Elizabeth The Queen Mother lived and worked and you'll quickly catch on to the sense of history that's Walmer. William Pitt moved to the castle after having to sell his own residence to pay gambling debts. The Duke of Wellington actually died at Walmer - and don't miss the Wellington exhibition when you visit! - and Queen Victoria stayed here with her husband and their two children during a holiday. Walmer is a lovely place to explore - and Kent is simply awash with castles and historical sites. For us, one of the marvels of Kent (and Sussex) is the variety of holiday cottages that are available for rent. From the former home of Thomas Payne in the historic port of Sandwich, to a lookout on top of the White Cliffs of Dover where Churchill once stayed. From a lighthouse in Herne Bay to an Oast House in central Kent... the array of cottages is simply amazing. You can check out my favourites and lots more on this page. It was National Pie Day this week and if you've visited our Facebook page, you'll know that my absolute favourite is Shepherds Pie. The recipe for Shepherds Pie was one of the first pages I wrote for the website, but today I'd like to introduce you to another pie that takes my fancy: cheese and spinach pie. Like the best pies, it's very simple, relying on only a few ingredients but producing a super tasty supper dish. You can make it from scratch, or use leftovers, but either way - it's something nice and warming to come home to. You'll need spinach, potatoes and cheese - plus a few embellishments. Being pie, though, quantities don't really come into it. This is a dish where frozen spinach really works. I prefer frozen leaf spinach to chopped, but use what you like best. Defrost the spinach - best done in a sieve - and squeeze out as much water as you can before you go to cook it. If you're using fresh spinach, you want a lot - it shrinks dramatically as you cook it, so for a decent sized pie that feeds four you probably want 1kg of fresh spinach leaves. Wash the leaves, drop them into a pot and wilt for a couple of minutes. Cool and squeeze out the water. Now melt a knob of butter (25g / 1oz) in a pan and when it's starting to hiss drop in the spinach. Cook on a low heat for a couple of minutes, turning the spinach until it's soft and coated by the butter. Season with salt and a little ground cumin. You can also add a chopped clove of garlic if you like it. Then spoon the spinach into your pie dish and smooth down. Mashed potatoes are my ultimate comfort food! It matters little if I pair them with bangers and gravy, a fried egg or two, or turn them into a tasty pie. I love mash every way it comes. Mash them with butter and salt until smooth, then stir in a generous portion of grated cheddar cheese and stir until it's melted. I love cheesy mash, so I use a lot and to bring out the cheese taste even more I often add 1/2 teaspoon of mustard to the mix, too. If mustard's not your thing, you can leave it out. Spread the mash evenly over your prepared spinach and sprinkle the top with more grated cheese. February is the month I like the least. Usually by that time, I'm getting desperate to be outside and given the vagaries of the weather, this can be tricky. We're waiting for a bright, sunny day for a photo hunting run to Stratford-on-Avon, so if we're lucky, you might get to hear and see a bit of the Bard and his home town.